The price includes shipping by DHL courier. My first encounter with the Arabian Horse was a love at first sight. No other creature is able to provide more inspiration and emotion for my art. 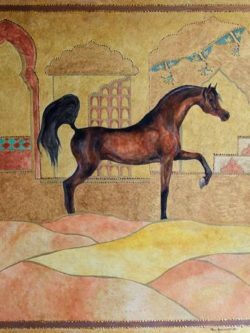 Twenty years ago I have decided to dedicate my painting activity to Arabian Horses in addition to dogs paintings and portraits. 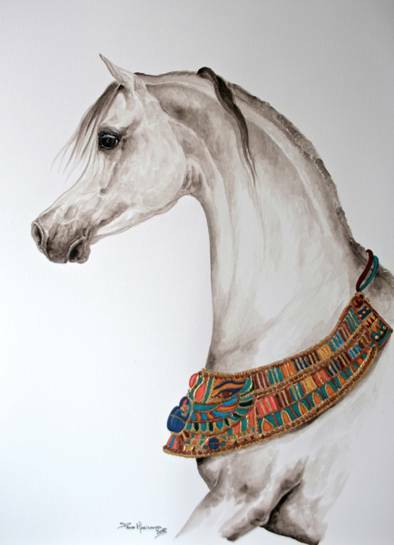 The fascination, elegance and nobility in Arabian horse breed is something unique and the important Cultural Heritage behind this breed is so remarkable and this is another factor that guided me toward a strong desire to explore deeper this breed, to be more and more involved in this painting activity. To portray Arabian horses is not an easy task, a lot of study, dedication, exercise and strong passion are required in order to obtain good results. I do love to represent Arabian Horses the way they really are, not exaggerating the breed main characters, showing the elegance, respecting the perfect combination of elements that create a wonderful horse with an excellent stamina, a beautiful horse but also a functional horse, my painting realistic style requires a lot of care to reach this goal. 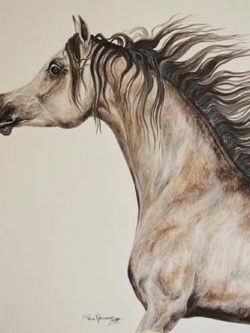 My favorite painting techniques are the classic oil colors on board, canvas or paper - watercolor and a mix-technique of watercolor-gouache, then the basic technique of drawing with graphite pencil or water-soluble pencils an ethereal, essential technique that suits perfectly Arabian horse ‘ethereal’ beauty. I like to paint head studies as well as full body horses even though believe that in case of a commissioned portrait it’s the head, with the right eyes expression that can identify better the ‘model’ portrayed. There is another very special painting production, I have named FAIRY TALES ARABIAN HORSES Collection that is a mix of watercolor, gouache, inks, gold leaf and acrylics, with a style different from the classic realistic paintings, with a lot of influences taken from the wonderful tradition of Persian and Mughal miniatures. 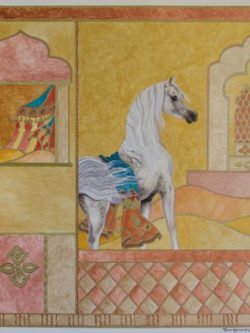 These works are very decorative because of the many colors used, because of the fascination given by the use of gold inks and gold leaf, a mix of fairy tale, fantasy and realistic style, these type of paintings can be applied also to portraits of specific horses. Over more than twenty years of painting activity I had also the honor to cooperate with Shows Organizers providing original trophies for the Championship classes, while my paintings and portraits are in the collections of the most important Arabian Horse breeders, worldwide and Arabian Horse owners. For an artist it is imperative to improve, to refine both the technique side but also the emotional side of his-her work, nice words of appreciation by my clients/friends assured me that I have reached over the years a very good level of quality, a maturity as far as style, soul and feeling are concerned but there is always always way to improve, to develop new techniques to experiment something new but always in the respect of this wonderful breed and my ‘personal’ style. My dream is to organize (hope in a near future) an exhibition to show my works, how my style and technique improved over these 20 years of Arabian Horse paintings and would love to produce a book to show the best of my painting production and to tell also something about my passion for Arabian Horse Breed because Arabian horses are an endless source of inspiration for me.... a vision of beauty, a vision of perfection, a joy for eyes and soul! All my works are completed by handmade folder to contain and protect the painting, the folder has artistic decoration and an handmade card, artistically decorated too, with painting description and my double signature.